Sure, this new Thor toy doesn’t come with an amazing circle of spinning hammers, but adding a great big piece of plastic to Mjolnir to make it look like it’s swooshing through the air is a definite plus. It’s all in the swing, right? We’ve had Iron Man and Spider-Man in Square-Enix’s Play Arts Kai Marvel Variants line, and now it’s the turn of the God of Thunder to get the wonderfully weird redesigning. Which, in this case, means taking the spikiness dial on his armour and cranking it all the way to eleven. Yes, Thor’s armour definitely has enough sharp edges on it to poke out every eye in Asgard, but that’s kind of the Play Arts Kai thing, and aside from that, it’s not all that out there as an look for Thor. That seems to be a running theme with these Marvel Variants: A bit out there, but nowhere nearly as out there as the company have been with their DC figures. Basically, what I’m saying is, where’s the Marvel equivalent of Bahamut Batman? Come on, Square-Enix. You have access to a whole host of weird characters. Go nuts! But meanwhile, we still have this pretty rad Thor. As well as the usual extra hands to pose and grip Mjolnir (which also cannot escape the spike-ification) with, Thor has an alternate yelling face you can swap in — and as you can see in the image about, it looks PETRIFYING when it’s not in use just sitting there alongside the army of disembodied hands — and not one, but two different effects pieces to attach to Mjolnir. One is the aforementioned swoosh-piece, and the other is some crackling thunder. 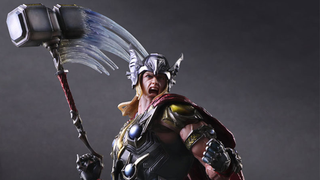 Thor will be available later this year, for the price of 14,800 yen — or around $122. What is it with the growing price on these Marvel Play Arts Kais? Iron man was just under $80, Spider-Man is $100, now this. If we get nearer to $200, I hope we get a Hulkbuster the size of my Torso or something.